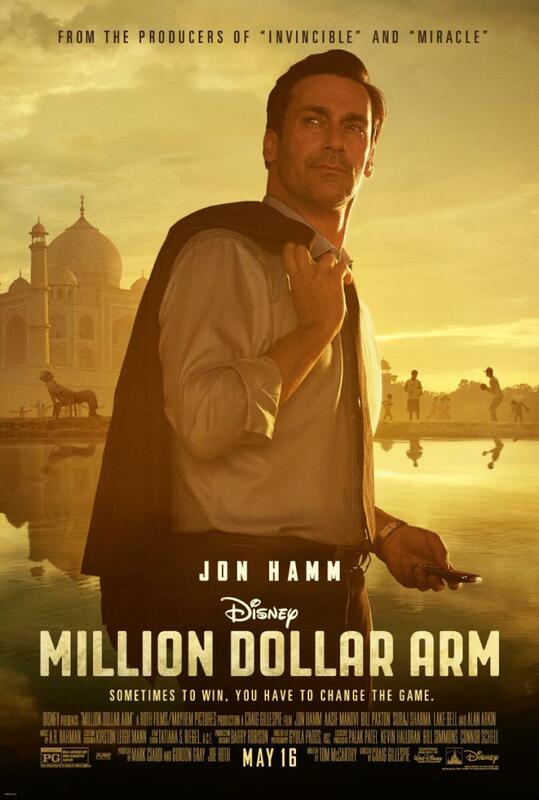 Million Dollar Arm – Sometimes to win, you have to change the game. JB Bernstein (Hamm) is having trouble running his athlete management firm since all of his clients have retired. He is trying to lock up a big name lineman from the NFL in order to keep his business afloat. That athlete named Popo (Maualuga) is also talking with another management firm making life difficult for JB. His business partner Aash Vasudevan (Mandvi) is debating on how much longer the business can continue without a new client. He introduces JB to cricket and late at night while watching television JB has the idea of getting a cricket player to throw for professional baseball. They get funding for the idea and start the contest in India called “Million Dollar Arm”. JB hires Amit to help them, mainly because he agrees to work for free. Roughly, thirty-eight thousand contestants tried out for the contest. Rinku (Sharma) and Dinesh (Mittal) were the two finalists that were brought back to the United States for a chance at Major League Baseball. While in India, we are shown the struggles of poverty and JB has a glimpse of what family means to these young men. There is a touching scene between Dinesh and his father, where Dinesh is trying to explain that he has to go to America. He is actually hoping for his fathers permission to leave and for the first time in his life he is daring to dream. Rinku’s mother is worried her son is leaving the village for the first time and wants JB to look after him. I often wonder when watching movies about other cultures how well the movie portrayed the culture. I am not from India and I have no idea if the families are like that or not, but I hope this is a good portrayal. It appeared that the movie did the Indian culture justice but I am an amateur at this so don’t take my word for it. We watch as the characters grow and learn from each other. The two pitchers are homesick, JB is too stressed about his business, Amit wants to teach baseball in India and they all need each other. Later, Amit gives a speech to both Rinku and Dinesh as a coach, for me this was great moment in the film. This is a movie that puts family first and we are left feeling good after seeing this great story. Directors’ Previous Movies: Fright Night, Mr. Woodcock. If you liked this try: Hoosiers, The Natural, Moneyball.